Cognitive SEO is a tool aiming for backlink analysis in general, but at unnatural link-detection in particular. Every SEO consultant knows that links are very important. However, where in the past every link counted, this is not the case anymore since Google released the Penguin algorithm. This was aimed at fighting links acquired in an unnatural way (buying or trading, link-schemes, etcetera). Especially if you previously worked on getting links in this manner, you might be penalized by Google. 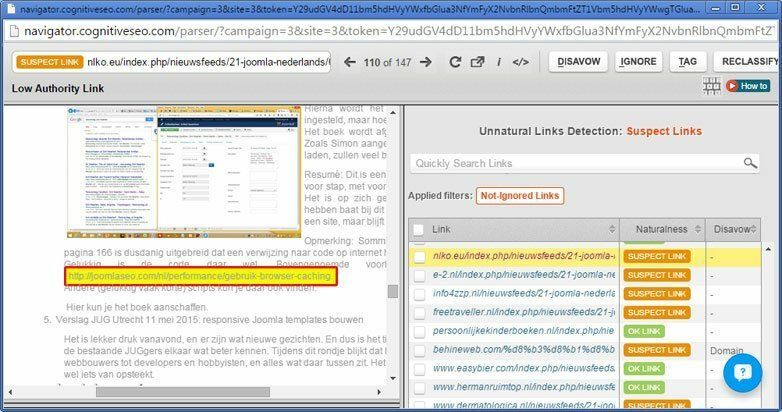 Cognitive SEO aims to detect whether the link-profile that a website has is unnatural or not. Also it can help you recover from penalties by collecting the bad links and telling Google to not count these links anymore (disavow) or manually remove them. So, how does the tool work? After you go through these steps, the system needs a minute to crawl your site and the links to it. After it is finished you see a detailed breakdown of the links to your sites in various graphs, like the distribution in follow versus no-follow links, country, top-10 referring countries, domains, etcetera, plus the full list of links of course. All extremely interesting, but for now, let's move forward to the unnatural links detection. In the end, you will have to go to Google webmaster Tools (google.com/webmasters/tools/disavow-links-main) and upload this file. Note that Google warns you that this is an advanced feature that could possibly harm your site if used incorrectly. If all goes well, Google will then process the links, disvow them and hopefully restore trust in your site if it was penalized. This might take quite some time though, based on whether Google activates any (Penguin) updates or not. So, to summarize: if you have a site that you think could be affected by unnatural links, taking Cognitive SEO for a test-drive could be a smart thing to do.